This little notebook, covered in marbled paper, was clearly well-used. It once belonged to a young woman named Adelaide H[oratia] E[lizabeth] Seymour and is now UPenn Ms. Codex 1757. While the notebook itself is common, its contents provide a fascinating look at Victorian reading practices, consisting of “Extracts from Novels etc.” which Adelaide read over a period of three years, between 2 September 1848 and 26 October 1851. It is a manuscript commonplace book, in which she copied out sentences, paragraphs, and extended passages from the works she was reading, extracts which clearly must have struck her as useful or important for what they had to say about good and evil, life, death, and love. Her reading material is primarily fiction, mainly contemporary novels written by women, though the notebook also contains entries from earlier novels such as Sir Walter Scott’s Waverley and Madame de Staël-Holstein’s Corinne, ou L’Italie, along with a handful of non-fiction works. While most of her reading material is in English, some novels, like Corinne, were read in French. 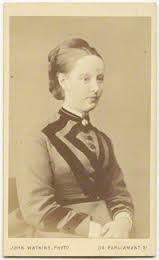 Adelaide Horatia Elizabeth Seymour (27 January 1825- 29 October 1877) was the daughter of Colonel Sir Horace Beauchamp Seymour (1791-1851), a member of Parliament from 1819 until his death, and his first wife Elizabeth Malet Palk. She was the second wife (married 9 August 1854) of Vice-Admiral Frederick Spencer, 4th Earl Spencer (1798–1857), making her Countess Spencer, and bore him two children, a daughter, Victoria Alexandrina, and a son. Her son, Charles Robert Spencer, 6th Earl Spencer (1857–1922), was the great-grandfather of Diana, Princess of Wales, making Adelaide Diana’s great- great-grandmother. That makes her the great-great- great-grandmother of Prince William and the great-great-great- great-grandmother of William’s son, Prince George. Adelaide was twenty-three when she began this commonplace book. The last entry is from 1851, three years before her marriage. During this period she travelled regularly, and the entries often mention the locations where she is staying when she copies them out. These include Stoke, Hampton Court, Cowes, Torquay, and London. She often includes the volume for a multi-volume work and sometimes the page number as well. Clearly this is the reading of a well-connected young lady with time on her hands. Given the amount of contemporary literature that she was reading, one wonders how she gained access to the books. Was it through book shop purchases, loans from friends she was visiting, or from one or more circulating libraries? Perhaps a mix of all three. The dated excerpts are in chronological order, except for the period between April and August 1850, when the dates of the extracts go from July to April to August to July, and then back to August. This commonplace book appears to be a fair copy, and Adelaide may well have written the excerpts on separate sheets of paper, only to copy them into her notebook at a later date. Some continue to be read today, like Charlotte Brontë’s Shirley and Sir Walter Scott’s Waverley, while others like The Rectory Guest and The Maiden Aunt are nowadays little known, let alone read. A passage “from Julia Ponsonby” which shows up in Etienne de Jouy, L’Hermite La Guiane (1816) and is reprinted later on in Lady Sarah Davison Nicolas, The Cairn: A Gathering of Precious Stones from Many Hands (1849), probably the source for it here. These words appears to be from Sarah Lewis, Woman’s Mission (1st 1839), which went through numerous editions into the 1850s. Parts of it were often reprinted in the newspapers and magazines of the day. The second is attributed to “Rev’d R Cecil’s letters”—it is from a letter by the Rev. Richard Cecil to his wife, printed in The Works of the Rev. Richard Cecil (1st, 1811). This is from Jeremy Taylor, Christian Consolations Taught from Five Heads in Religion, reprinted in The Whole Works of the Right Rev. Jeremy Taylor. This is attributed to Massillon, “On the small number who will be saved” and appears to be from an English translation of a sermon by the French Catholic bishop Jean-Baptiste Massillon (1663-1742). This little notebook will surely be of interest to those studying women’s reading practices of the nineteenth century. In the future, we will contribute information about Adelaide and her commonplace book to the Reading Experience Database, 1450-1945 (http://www.open.ac.uk/Arts/reading/).